The meeting began with a special rendition of O’Canada in English, French and Cree to honour National Indigenous Peoples Day - celebrated on June 21. The first-ever First Nations, Metis, Inuit Student Advisory Council presented to the Board on their plans. They shared on wanting more connections with Elders so they can learn more about their culture, and the goal to have parent involvement in future meetings. They appreciated Fort McMurray Public School District for launching the group; and helping them promote their cultural identities. The Council is also working on a logo. Stay tuned for the finished product via FMPSD social media portals @FMPSD. CG Recyclers presented on their school audits to reduce waste - complete with data collection, graphs, assessments, and results. They launched the audit last December, and learned classes were averaging four bags of garbage per day. To curb this, they implemented waste-free lunches, and brought the volume down to two garbage bags a day/class, as of this April. 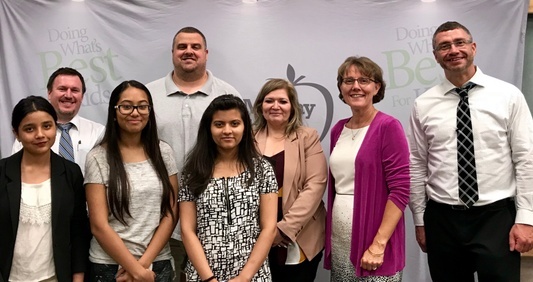 FMPSD is proud to have four representatives from Westwood Community High School: Ishani Patel, who participated in the panel discussion recently, Urvi Patel, Vrunda Patel, and Kanisha Lala. They appreciated being given the opportunity to learn more about the education system, and its protocols. And, were impressed to see how student input was welcomed by officials. Fort McMurray Public School District (FMPSD) congratulates Eco YOLO, École McTavish Junior High School’s environmental group, who recently won Alberta Emerald Foundation’s $5000 award in the Youth category for their project “Mission Replant Fort McMurray.” The group spoke about the trip. Congratulations again to École McTavish Junior High School on receiving Alberta Emerald Foundation’s inaugural Energy Efficiency Award. 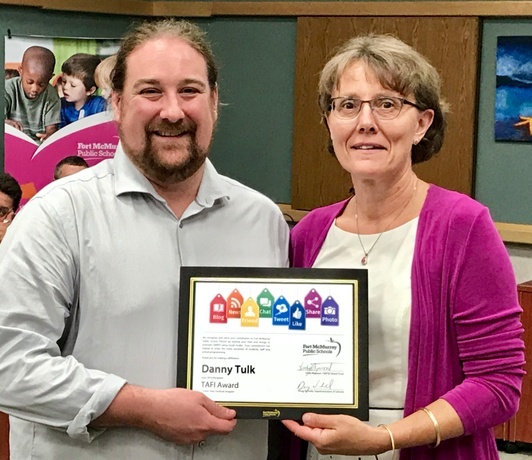 Brad St. Denis, a McTavish teacher applied for a grant, and the result was this award for the school’s student run environmental group, LEAP - Leaders in Environmental Advocacy & Protection for the solar powered classroom with the greenhouse and the gardens project. Congratulations to Jillian Jones, a grade 12 Westwood Community High School student who won the annual Visual Art Award for her piece: “Dangerous Woman.” It was done in charcoal and pencil, and was inspired by the R&B artist Ariana Grande’s album cover of the same name. The Innovative Leadership Award is given to a staff member, who leads an innovation which results in higher achievement or production. Vicki Dawe, Biology teacher at Westwood Community High School is this year’s recipient. Vicki has been with FMPSD for 20 years. She has cultivated a love and appreciation of science in students, and staff. The driving force behind the Wood Buffalo Regional Science Fair, which sees heavy FMPSD presence and wins every year, Vicki tirelessly encourages students to champion innovation, and to fearlessly apply their ideas to projects. The award was launched in 2015 when Mark Wilson, now Vice Principal, Composite High School received it. Ali Syed and Syed El Mejdani were the recipients in 2016, and last year saw Kitty Cochrane and Johnny Dulku acknowledged. This month’s TAFI (Twitter, Apps, Facebook, Instagram) Award went to Danny Tulk, Vice Principal, Composite High School. He is the face behind Composite’s vibrant Twitter with over 900 tweets, Instagram and Facebook accounts. If you are on any or all of these portals, you can’t miss the “Meet Your Miners,” vibrant yellow and black school colour graphics he creates. It is a campaign he launched a few months ago to promote events/students/staff and school activities. And, the messaging is continuously boosting student and staff morale. Danny was also active on Westwood’s social media when he was the vice principal there, prior to joining Composite High School. 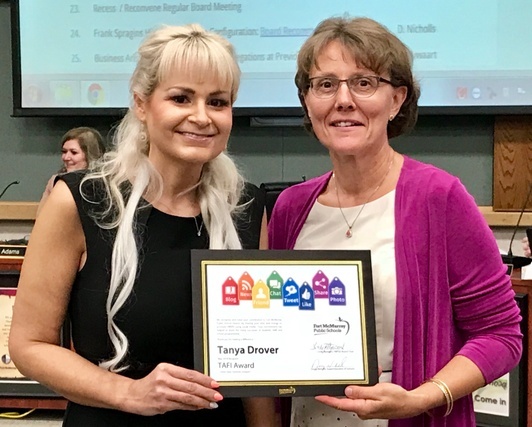 Tanya Drover is our May TAFI (Twitter, Apps, Facebook, Instagram) Award winner. She is a grade four teacher at Christina Gordon Public School, and is @TanyaDrover on Twitter. Tanya has over 1140 tweets. She is a continuous promoter of all the amazing things happening in her class, and does the same through her Instagram account: @MrsDroversclass. She tweets, and instagrams beautiful photo collages, and ensures her students’ activities - whether they are cooking, working on Math, or doing community clean-up are always highlighted. That the Alternative Program at Frank Spragins High School move to a grade configuration of grades 7-12 to match the three other high schools in FMPSD effective the 2018-2019 school year. Students would only be accepted in the junior high program after appropriate assessment and consultation with the outgoing school principal, the Student Services’ Department, and the principal of Frank Spragins High School. September 26, 2018 at 3 p.m.